By now you have heard that Hanukkah comes very, VERY early this year – as in, it overlaps with Thanksgiving for the first time. Don’t get used to it; it won’t happen again for over 70,000 years (yes, that number is correct). As I write this in early October, the first “Thanksgivukkah” web sites are already popping up, so I’ll leave it to the comedians to explore the joy of eating stuffing and latkes on the same day. What I want to talk about is what happens later – when Hanukkah is over. The last day of Hanukkah is December 5th, which means the “Christmas season” will just be getting up to full speed when we put our dreidls and hanukiyyot back in storage for another year. 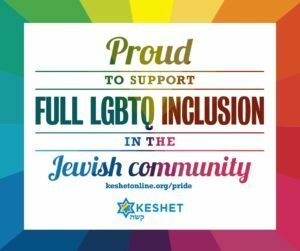 This will give us a unique opportunity to engage in something the Jewish mystics call tzimtzum – making ourselves smaller so there is room for other people and other ideas. Consider: living as we do in a “very Jewish area,” the highest estimates of the local Jewish population are around 25%. That means that 75% of our neighbors are not Jewish, and it’s a fair assumption that many if not most of them are Christian. From December 6th through the end of the year, I think it is important for us to see ourselves for what we are: a tiny minority (two percent of the US population) living in a land which has given us the gift of complete freedom and equality. We are not simply “tolerated” here, nor are we “protected” by some benevolent ruler; we are citizens who need not apologize for or hide our Jewish identities. That is pretty amazing, if you look at the history of the world. So what should we Jews ask for during the Christmas part of the “Christmas season”? Nothing. In fact, we should demand nothing, which will be quite a shock to people. Personally, I don’t want to hear “happy holidays!” on December 20th, because it is not a holiday for me. Hanukkah isn’t the Jewish Christmas, and as we see this year, sometimes it doesn’t even happen at the same time. By December 20th Hanukkah will have been over for more than two weeks, and the approaching holiday is Christmas. And only Christmas. I know many retailers have instructed their employees to say “happy holidays” instead of “merry Christmas,” and I’m not going to try to re-educate them. But when people say “merry Christmas” to me this December, I am going to respond in the proper, Jewish way: “Thank you, and the same to you!” I will not be insulted, I will not feel slighted and I will not feel discriminated against. It’s Christmastime. There are times when we Jews have to stand up for our rights. We do this and we teach our children to do this. But there are also times for tzimtzum, for letting go of issues which aren’t a threat to us or to anyone. This year’s “Thanksgivukkah” will present us with one of those times, and I hope we use it to take a breath, take a step back, and enjoy the blessing of Jewish life in the United States. We will still have our annual “bring your own hanukiyyah” Shabbat service but it, too, will be in November. On Friday evening, November 29th, at 6:30 p.m. – the day after Thanksgiving – bring your family, bring your hanukiyyah and four candles… but please don’t bring turkey leftovers.